In astrology a triplicity is a division of the 12 signs of the zodiac into a specific group of three. Since there are 12 signs, they can be divided evenly into four sets of three, which are referred to collectively as the triplicities. Each triplicity consists of three signs that are configured to each other by trine, although the triplicity and trine aspect are conceptually distinct. Although the specific qualities associated with each of the triplicities sometimes varies from tradition to tradition, the groupings themselves have been constant since the late Mesopotamian tradition. Astrologers began dividing the signs of the zodiac into triplicities in the late Mesopotamian astrological tradition, sometime around the middle of the 1st millennium BCE. In the early Hellenistic tradition this practice of dividing the signs into triplicities was adopted, although some differences in the use of the division arose. By the 1st century CE some astrologers associated the four triplicities with the four cardinal directions: north, south, east and west. They also began associating each triplicity with a specific set of planetary rulers known as the triplicity rulers. 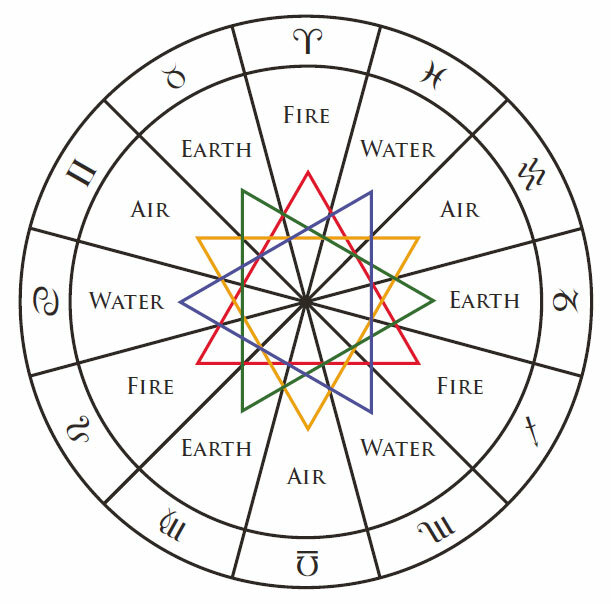 By the 2nd century CE some astrologers began associating each of the triplicities with one of the four classical elements: earth, air, fire and water. These elemental associations were not adopted universally at first, although they appear to have become common in astrological texts during the Medieval period, especially after the 8th century. 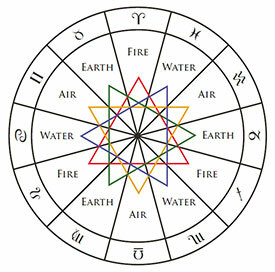 The association between the triplicities and the four elements that became common in late antiquity is generally taken for granted by most western astrologers today, to the extent that the concept of triplicities is sometimes seen as interchangeable with the association of the elements with the signs. See the diagram to the right for a visual illustration of these assignments. Chris Brennan, “The Planetary Joys and the Origins of the Significations of the Houses and Triplicities,” originally published in the International Society for Astrological Research Journal, Vol. 42, No. 1, April 2013.